It’s been three weeks of laughing ourselves silly and last night saw the final show of the 21st NZ International Comedy Festival. Last Laughs is a great way to catch some of the many highlights of the festival but it also plays host to the awards! Before the show there where some industry awards with Best Facial Hair going to Jamaine Ross, Best Auckland Newcomer to Tim Batt, Best Wellington new comer Sam Smith and Spirit of the Festival to Stuart Goldsmith. Best International went to the brilliant Tom Binns as Ian D Montfort! Then it was on to the show hosted by Steve Wrigley and Ben Hurley. First up were the five Billy T Nominees.The Billy T Award is for those comedians who have earned their strips and are ripe for some comedy recognition. This years talented bunch were Rose Matafeo , Eli Matthewson, Pax, Tom Furniss and Joseph Moore. All gave strong performances but the prize went to Rose Matafeo, who took the towel from her boyfriend, and last years winner, Guy Williams. You can hear more from all the nominees here in our preview podcast. 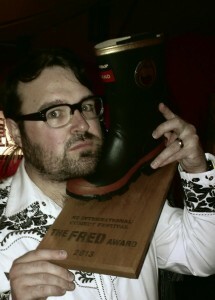 The FRED Award finalists performed next to win the coveted gumboot. The finalists for this year’s best show by a New Zealand Comedian were James Nokise, Jarred Christmas and Nick Rado. After three hilarious sets the prize was awarded to Jarred Christmas whose acceptance was heartfelt and well genuinely chuffed! You can hear more from Jarred Christmas here on our Comedy Podcast. James Acaster performed while the judges deliberated and showed why he was a sell out at The Classic this year. Fingers crossed he returns for another NZ Comedy Festival next year! The other award handed out last night was the TV3 Peoples Choice Award. Voted for by the public this went to Urzila Carlson. A truly deserving winner whose sell out show at the festival The Long Flight To Freedom received many 5 star reviews. Last Laughs was a wonderful showcase of the best of the fest, and a perfect ending to the NZ International Comedy Festival 2013!